The Eisenhower Memorial Tunnel went under construction March 15, 1968. A four-company joint venture, Straight Creek Constructors, held a contract with the the Colorado Division of Highways to drive two lanes of an eventual twin bore tunnel under the Continental Divide, 60 miles west of Denver. Portal/ventilation buildings for the twin tunnels would be included, and stubs of the second bore would be driven. The first bore would be ready for use and employed for two-way Interstate 70 traffic in three years. The second would be completed several years later. But there were obstacles. Men and machines labored at lowered efficiency at eleven thousand feet. Winter kept the working season painfully short outside the tunnel. And the mountain wasn't 100 percent cooperative, or even 10 percent at times. Unprecedented stress showed up where theory dictated otherwise. New methods were needed, and were developed, to mine and support a hole some fifty feet high and forty-five feet wide. It was another of those cases where fact and theory had to be reconciled. Finally, the job was ready for traffic, but only after five years of soul searching, back breaking and budget busting. As one veteran highway engineer put it, "We were going by the book, but the damned mountain couldn't read." The Eisenhower Tunnel was first called the Straight Creek Tunnel, a name derived from the valley where the west portal is located. The Colorado State Legislature chose the new title in 1972, officially designating it the Eisenhower Memorial Bore. Dedication of the first of the twin tunnels came on March 8, 1973, and the project was opened to two-way traffic on that day. Users of Colorado highways and those of other states provided the financing through state and federal road-use taxes. Federal aid accounted for about 92 percent of the $108 million needed, and was administered through the Federal Highway Administration. The rest was state funded. The prime contractor for the mine and seven-tenths of the project was Straight Creek Constructors. Venture members were Al Johnson Construction Company (Minneapolis), Gibbons and Reed Company (Salt Lake City), Kemper Construction Company (Los Angeles) and Western Paving Construction Company (Denver). At the height of activity, as many as 1,140 persons were employed in three shifts, 24 hours a day, six days a week. The names of all concerned are too numerous to mention. Certainly, they viewed the end of the task with a varied mixture of relief, regret and pardonable pride. 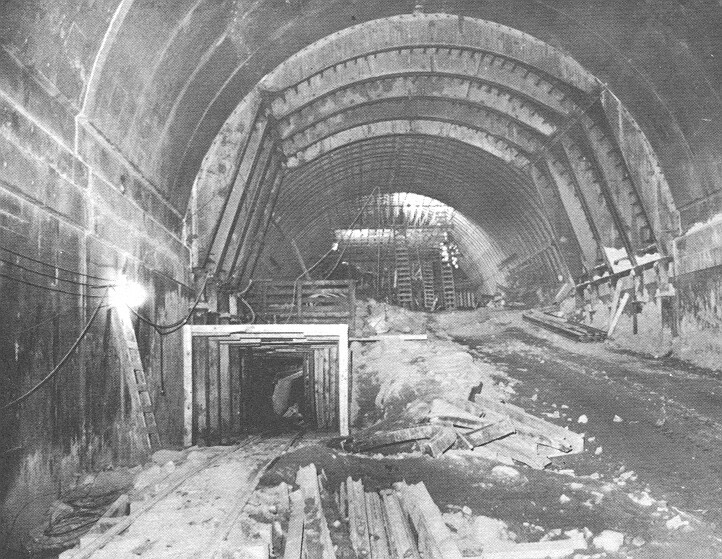 Bids were opened on Oct. 3, 1967, for construction of the first vehicular tunnel. 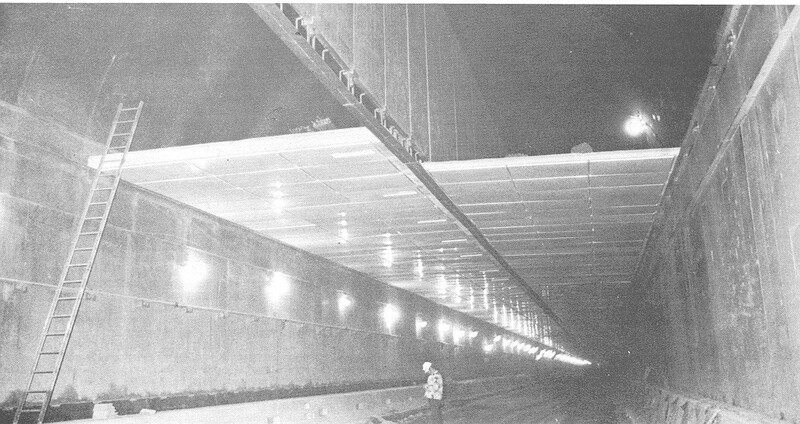 installation of necessary facilities for use in the westbound tunnel, such as lighting, other utilities and the electronic surveillance system. The east entrance is in Clear Creek County, the west entrance in Summit County. The east entrance is approximately 60 miles west of downtown Denver, and roughly 10 miles west of Silver Plume. From the west, the tunnel entrance is is about seven miles southwest to Dillon. The facility lies entirely within Arapaho National Forest land, and no privately owned right of way is involved. The west portal is in the valley of StraightCreek, while the east portal is in Loveland Basin and the valley of South Clear Creek. From outside, face to outside face of the ventilation buildings, the distance is 8,941 feet—or 1.693 miles. Of this distance, there are 7,789 feet of rock tunneling, and a total of 1,152 feet of ventilation/portal structures and cut-and-cover sections at the east and west ends. The elevation of the finished westbound roadway at the outside face of the east ventilation building is 11,012 feet, at the outside face of the west ventilation building is 11,158 feet, and under the Continental Divide is 11,112 feet. The Clear Creek/Summit County line runs along the Continental Divide, and is at an elevation of 12,608 feet as it crosses over the tunnel, roughly at a right angle, or 1,496 feet above the tunnel roadway elevation. The crossing is 2,821 feet east of the west entrance—locating that portion of the tunnel in Summit County, and the rest in Clear Creek County. It is the highest vehicular tunnel in the world. The westbound tunnel climbs from east to west at an average grade of 1.64 percent (rising 1.64 feet for each 100 feet on the horizontal). There are slight vertical curves in the eastern half, and a vertical curve inside each portal serves as a transition from the tunnel grade to the grade of the approach roads. At the circumference, the tunnel shape varies according to the type of rock encountered, from a straight-leg horseshoe pattern to oval—the latter used where rock stress is greatest. Maximum planned height of the rough bore was about 48 feet, and maximum width was 40. There are several different types of tunneling sections. However, because of the lining inside the portals, motorists travel through a rectangle that is uniform in size and shape. Vertical clearance for vehicles is 16 feet, 4 inches (this does not include a series of tunnel message boards, which adjust the overall clearance to 13 feet, 11 inches), and there is 26 feet of travel width (two lanes of 13 feet each). Above the ceiling, there are fresh air and exhaust ducts, and there is drainage provided beneath the roadways. Tunnel attendants have a walkway beside the vehicle travel lanes and access to the eastbound tunnel by three cross passageways. The ventilation buildings each measure 252 feet in width, 185 feet in depth and 50 feet high. Ventilation stacks stand an additional 30 feet above the buildings. The westbound tunnel runs generally east and west, and curves slightly about midway into the mountain. The second, or eastbound bore, of the twin tunnels was later constructed in a more or less straight line. Centerline to centerline, the twin tunnels are 115 feet apart at the east ventilation building entrance, 120 at the west ventilation building entrance, and some 230 feet at the widest point of separation under the mountain. At one time, there was a tram car suspended from the wall, a gasoline-powered unit that could travel the length of the tunnel, carrying an attendant. An emergency power system is in place to use as emergency backup, in case of interruption of the commercial source of electricity. Closed-circuit television allows control room operators to monitor traffic flow from the control room in the east ventilation building. Geologic studies show that bedrock in the tunnel areas consist of 75 percent granite, and 25 percent gneiss and schist. There are local dikes of augite diorite. There are faults and shear zones as well as solid bedrock. In the pilot bore, 26.5 percent of its length was in self-supporting rock; 73.5 percent required supports in varying degrees, and the total footage of what tunnelers call "bad" rock was 820 feet. Because the location of the westbound bore lies between 115 and 230 feet to the north, rock conditions there did not exactly duplicate those of the pilot tunnel. Extrapolation from stresses measured in the pioneer bore to those expected in the vehicular tunnel did not prove to be absolutely exact in every case. For Straight Creek Constructors, the joint venture that held the contract, these men were in charge at the site at the opening date, March 8, 1973. Members of the contracting combine were Al Johnson Construction Co., Minneapolis; Gibbons and Reed Co., Salt Lake City; Kemper Construction Co., Los Angeles; and Western Paving Construction Co., Denver. The call for bids opened on Oct. 3, 1967. This bid request represented the fourth one for a highway tunnel under the Continental Divide. 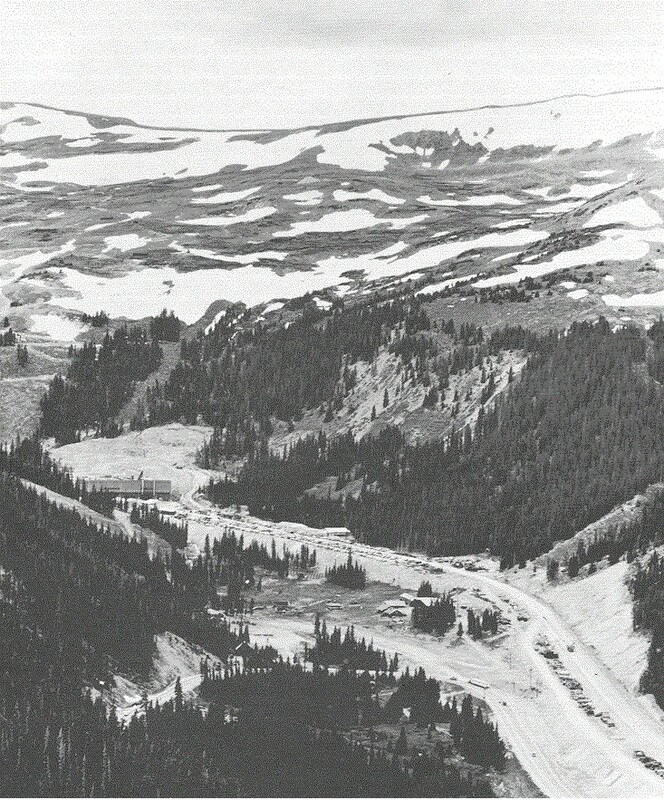 Following completion of a pioneer bore under Loveland Pass, in May 1943, the Department of Highways advertised for bids on a vehicular tunnel at the site, and received only one offer of $10 million on Sept. 16, 1947, which was not formally considered as it was a sole bid and far in excess of the engineers' estimate. Upon readvertising, the Department received no bids on opening day, Dec. 17, 1947. 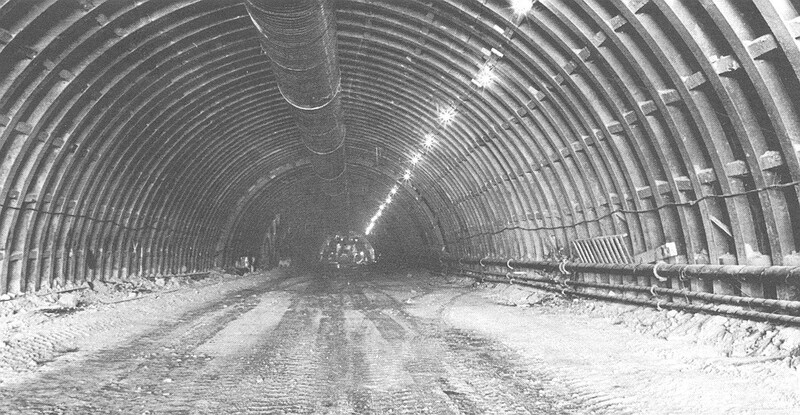 In 1956, bids were opened April 16 on two tunnel projects—one for Straight Creek and the other at Berthoud Pass. Only one valid bid was received on each, and no contract award was made. Emphasis on a tunnel stemmed from a Bureau of Public Roads designation in October 1957, of a stretch of I-70 between Denver and Cove Fort, Utah. Federal money was not made available for construction on the Denver-Cove Fort leg until the 1962-63 budget. In a report submitted to the Department on March 1960, an engineering firm—E. Lionel Pavlo, New York City—picked Straight Creek as the best of eight possible interstate routes between Empire Junction and Dotsero. It pointed out the need for a tunnel because of the impossibility of getting over the Divide while maintaining interstate standards. In several contracts in 1962 and 1963, the Department of Highways provided for approach roads to the site of a pioneer bore that would be driven on the Straight Creek route, then contracted for the pioneer tunnel in October 1963. Mid-Valley, Inc., Houston, holed the tunnel through Dec. 3, 1964. Federal aid on this interstate project was 91.32 percent. The contracting venture started the project on a basis of pay-by-bid items which, when totaled, amounted to the low bid. However, effective Dec. 16, 1970, pay procedures on mining items were changed to a cost basis because of difficulties encountered in mid-mountain. From the start of preliminary engineering to closeout of the project, about $108 million was expended and, at the time, a record for a federal aid single project. Compared to a Division of Highways' estimate of $42,479,000, the low bid of $54,140,486 was accepted on Oct. 3, 1967 from Straight Creek Contractors.